Do I need to create my own instances? The Carpentries staff will create AMI instances for you. Please contact team@carpentries.org. you will need to create your own AMI instances using the launching your own AMI instance instructions. read the information and instructions below. See the detailed instructions on launching an Amazon EC2 instance for this workshop. You can launch any publicly available image by changing the AMI that you load in step 4 on that page. You can choose not to load an AMI at all, and install your own software later by skipping step 4 on that page. If you want to launch a different set of resources- more processors, more disk space, different operating system, etc; you can choose a different option at step 5. For more detailed instructions, and how-tos for other changes consult EC2 Getting Started. Launching an instance on Atmosphere - These instructions are in beta and not fully tested! 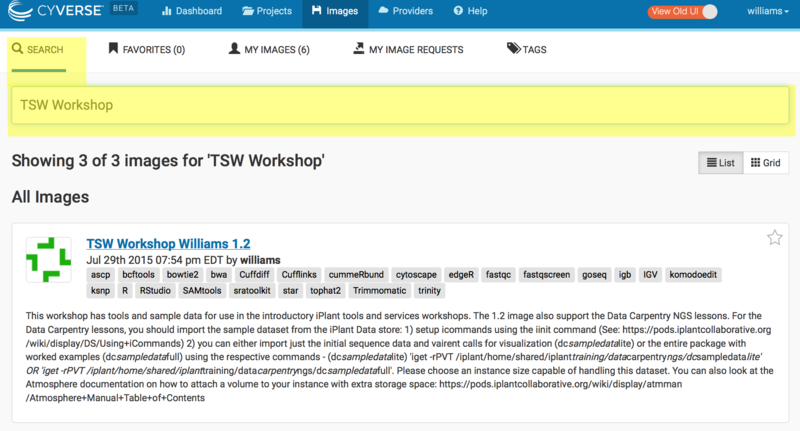 Search for the ‘TSW Workshop Williams 1.2’ image; Select this image. Project: Choose an existing or create a new project. Instance Size: small2 Click Launch. Your instance should be ready in 10-15 minutes. When your instance status is listed as ‘active’ you will be able to connect. Click on ‘Projects’ and select the project that contains your instance. Verifying that your instance status is ‘active’, copy the IP address (e.g. 128.123.12.34) to your clipboard. When prompted for a password, enter your iPlant username. Note: In the above example ‘iplantusername’ will be your actual iPlant username. When prompted for a password enter your iPlant password. Note: In the above example ‘iplantusername’ will be your actual CyVerse username. The sample dataset is NOT included on the Atmosphere instance. The very first time you load the instance, you will need to copy data from the public CyVerse Data Store into your instance using the following instructions. 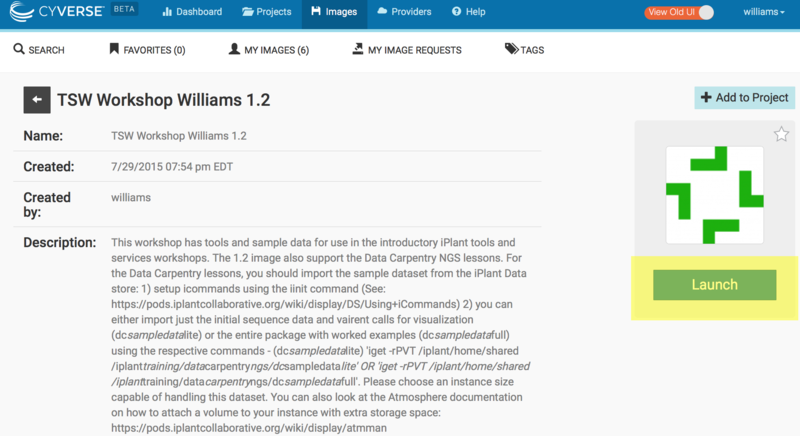 $ iget -rPVT /iplant/home/shared/iplant_training/data_carpentry_ngs/dc_sampledata_lite . using ls you should be able to verify you have downloaded the dc_sampledata_lite directories and files. When you are finished with your instance, you must terminate. Follow the following steps. 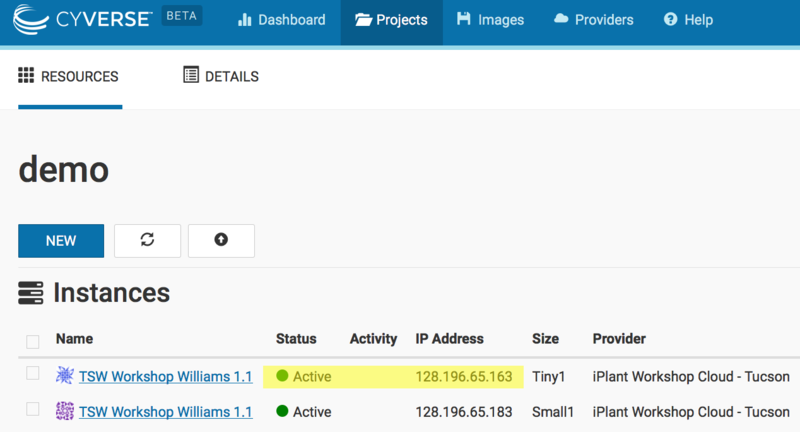 Click on the instance name to get to the ‘Actions’ menu. You may then select the ‘Delete’ button to terminate the instance. Warning: This will delete any data on this instance, so you must move any data you wish to save off the instance (for example by using iCommands). After reading the warning and confirming you are ready, click ‘Terminate’ to terminate the instance.